With over 20 years of experience in the Plumbing industry, there should be no question who you can trust on any Commercial job. American Plumbing Contractors has not only the experience necessary to run the job, but also has the qualified plumbers to do the job right the first time. Our portfolio of jobs completed consists of Multi story hotels, healthcare facilities, restaurants, car dealerships, water treatment plants, custom homes, and others listed below. We specialize in design builds and can make your job care free by not only designing the plumbing system but providing the plumbing drawings as well. Regardless of the job, when you partner with American Plumbing Contractors safety is always the top priority we hold regularly scheduled weekly safety meetings on the job to ensure that safety is of the utmost importance. 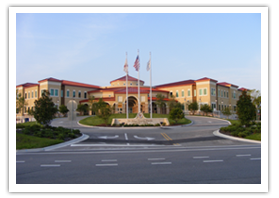 "We have contracted with American Plumbing on over 80 new construction projects in Jacksonville. We consider American Plumbing to be one of our finer contractors, both in job performance and meeting the schedule. Mr. Miller and his employees have the knowledge and capability to allow their jobs to run smoothly and efficiently." "Mr. Miller is a competent individual of sterling character and the highest degree of responsibility. I recommend him and his company enthusiastically and without reservation."